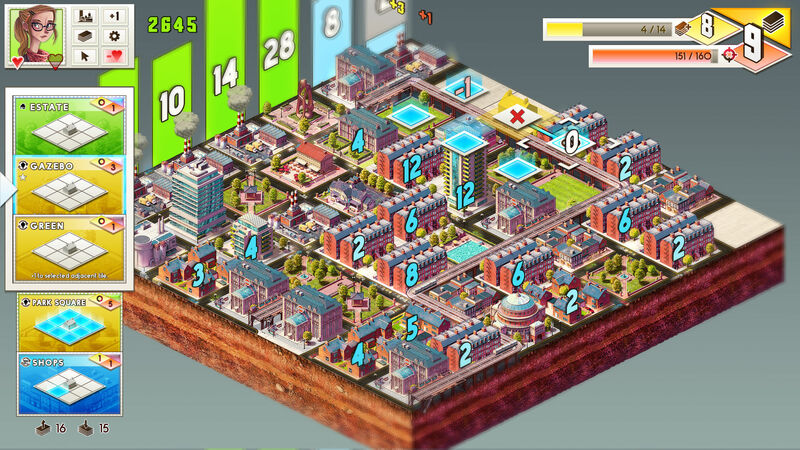 Urbanomino explores how a city building game like SimCity might function when the people, the businesses, and developers of a city have a stake in shaping their city. By using a voting system Urbanomino introduces an element of organic unpredictability to simulating the growth of a modern urban environment. I’ve loved the game series SimCity for the longest time. The way it presents the modern metropolis as a garden waiting to be composed upon was a wonderful experience. Yet, what SimCity presents is not a Democratic American city, but a dictatorship. Giving the player the power to instantly clear swaths of land and evict citizens from their homes with no consequence is totalitarian. Urbanomino explores the role of a modern urban planning committee and how cities are shaped not by dictators but by many people trying to envision what they want in their city. Choosing a name for this game, has been an interesting ride. The previous city game project I worked on, City Clicker, started as my love of the ‘clicker’ genre of games. These simple games that took the idea of scaling to an impossible level. You would start by manually collecting currency, but quickly begin automating collecting currency faster and faster until you were automating the production of automation of currencies. These games were ridiculous and I wanted to make a city building game that captured that ridiculous expansion. The name City Clicker played perfectly off of games like Cookie Clicker or Clicking Bad. For this game, I started with the name of a book by ___, A Machine for Urban Renewal. Even though I couldn’t use that as the name for the game, I wanted to set my expectations for the tone of the game. We had been covering what might be the primary mechanic of urban development, Urban Renewal, for better or worse. At this point, I wanted to explore Eminent Domain in SimCity. Yet once I got closer and closer to the first big development at HackNYU 2016, I decided to switch towards something that would play more off of the process of placing tiles in the city. Urban Tetris was the working title I had when I came into HackNYU. It played on the rigid, square grids of Los Angeles and, by extension the first SimCity. I didn’t imagine the game playing exactly like Tetris, but where the layout of the city could resemble the chaotic mishmash of zones. 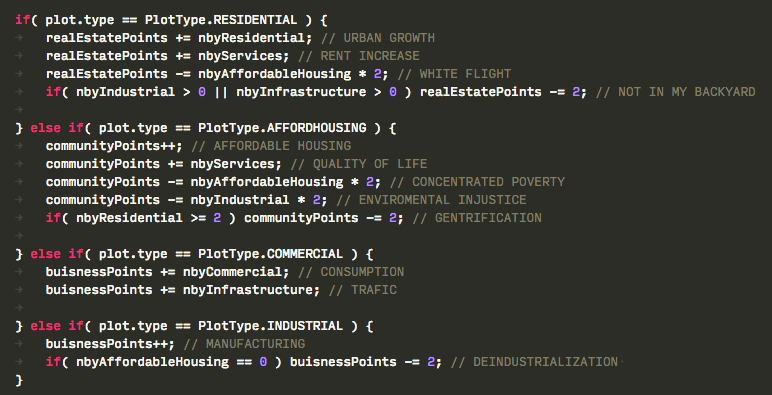 Once I was down to the last few hours of HackNYU, I threw together the name Urbaniniminoes at the last moment. I was going for Urban + Dominoes, but the name ended up being this nearly unpronounceable mess. Over the next few months, I shrunk the name down to Urbanamino based on feedback I was getting from classmates. This new name, though closer to Urban Dominoes, was still fairly confusing and when I presented at the NYU Tandon Senior Capstone Competition the confusing name became more of a problem. Though fun, confusing names make people feel uneasy, especially if they know they’re getting it wrong. One of the suggestions I got at the Research Expo was to change the second A to an O in the name, to make the name Urbanomino, taking as much as possible from Urban + Dominoes. Dropping the plural also made it shorter to pronounce or write. I’m kinda lucky that I’m able to make this last change before the game has had a formal release, but for now I’ve got to correct a few places where the old confusing name is still around. This new logo is made up of the top-down views of several of the more recognizable tiles in Urbanomino. It’s not the final logo, but arranging the tiles like an S shaped Tetrimino is a pretty neat play on the game. Urbanomino will be shown at the Integrated Digital Media Student Showcase this year! Check out this as well as my other projects and the projects of my really cool peers on May 12th at 6pm at MAGNET, 2 Metrotech, Brooklyn NY. A housing development built in complete desert in western United States. This image speaks so much to what that game could explore. Seen by one of the posters on r/brooklyn, the sign is a response to developers walking house to house trying to buy up property. Now that the basic rules for visualizing the city as tiles work, next comes the actual urban planning. For now, I’ve settled on using Molleindustria’s rules from MultipliCITY to create a basic scoring system for the AIs. The AI looks through all of the tiles and finds the ones where they would benefit the most from either developing on new land or using eminent domain to evict existing residents or businesses for a new development. If I add an extra property to the tiles, maybe ‘productivity’ or ‘maintenance’, I can better balance for eminent domain. Before we generate a proposal, the system has already calculated how much each tile is worth to each group, the Real Estate Developers, Businesses, and Community Organizers. Next, the system generates a weighted random list of developments that will be proposed. By having this be random, I account for that though all the groups may want a school somewhere, only once a variety of factors (basically just funding) line up can a school be actually proposed on a lot. Next, the groups need to pick which developments they want to propose. Each group can only propose certain tiles. For instance, Real Estate Developers can’t propose where to put an industrial development, but they would be disappointed if it’s near residential development. This means that perhaps services will be contested (with a contesting mechanic [hard!]) or each group will get a certain percentage of all service developments (easier). For voting, I have a system where the player has a certain number of votes to spend on several proposals. Proposals either need points spent on them to pass or are already passing and you would need to spend points to fight them. I’m thinking of using a timer to force players to make quick decisions on whether each development is good or bad. The later the game goes, the more hectic it will get and though you’ll have more votes, you’ll have more proposals and have to make rash decisions. Working on creating some models at HackNYU 2016. I’m using MagicaVoxel to make the models because it’s really easy to prototype cubed buildings that way.